Suze here, posting outside our regular schedule. But PJ Sharon’s new novel, PIECES OF LOVE, has just released and I couldn’t wait to ask her some questions about it. PJ will be in and out today to answer your questions too! She’s got a heck of a schedule planned for her blog tour where she’ll be giving away some neat prizes like signed books and a nifty beach bag! 1. Okay PJ, tell us a little about PIECES OF LOVE. So cool being on this side of the interview questions, Suze! Thanks for being here with me to celebrate and chat about the book. 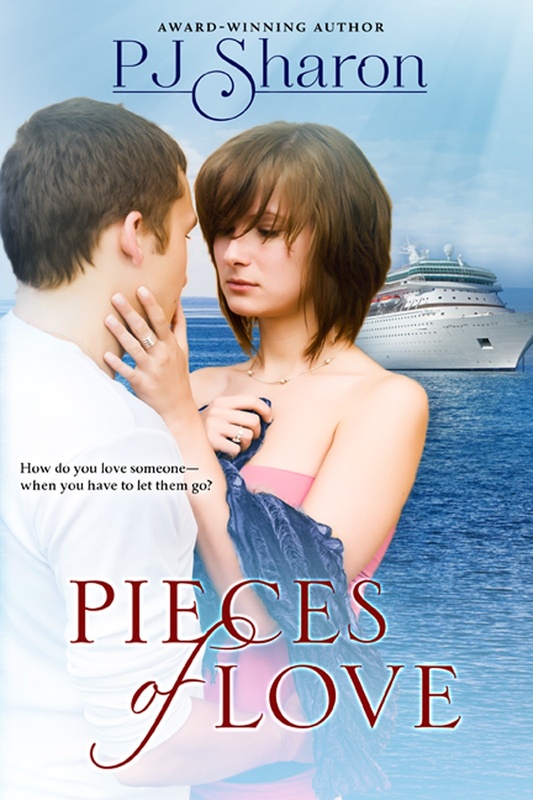 In PIECES of LOVE, a Contemporary YA Romance, sixteen year-old Alexis Hartman wants nothing more than to play her guitar and get high, hoping to escape the pain of losing her sister. But when her second arrest for pot possession leads to her mother’s breakdown, Lexi is sent to stay with her grandmother for the summer. While embarking on a Mediterranean cruise hardly sounds like punishment, being forced to face her demons and falling for a guy she may never see again gives Lexi a chance to discover what it means to love someone—even when you have to let them go. 2. A trip to the Mediterranean inspired the setting for this novel. What was the most beautiful or memorable place you saw on your trip? An impossible question to answer—mainly because they were ALL beautiful. But honestly, it was such a whirlwind trip, the days and ports kind of melted together, LOL. I remember LOVING Barcelona and thinking I had to go back to see more of Gaudi’s amazing work and the passionate artistry that infused every part of the city. I also remember not having a good impression of Cannes, France, but that’s because of a bad allergic reaction to the perfumes! The Greek Islands are heavenly, but I’d have to say Dubrovnik Croatia was one of the loveliest, most interesting locations. Old Town is a spot not to be missed! I have to go back just to walk the mile long, 19-foot thick wall surrounding the village. 3. A little birdie told me that there’s some extra special companion content that goes along with PIECES. Want to tell us about it? Um…you must be referring to the PIECES of LOVE theme song. This came about because my character, Lexi, is a song writer and singer. In an effort to get readers into her head, I decided to write a song for her sister in the book. In spite of the fact that I’ve never written lyrics before and don’t write music, the words flowed onto the page and a tune popped into my head to go with them. Funny how those creative little miracles happen. So I downloaded a recording app onto my phone and sang the song so I wouldn’t forget the tune. With four years of voice lessons behind me, it didn’t sound half bad. I approached my neighbor and good friend, Ozone Pete, who is a professional musician. Once he saw I was serious, he helped me with the arrangement. He happened to “know a guy” who runs a recording studio in Westfield, MA. A month later, I had recorded the theme song for POL. I was pleased enough with the outcome to put it up on i-Tunes for sale and used part of the song for the book trailer. 4. So, what was it like being in a recording studio? How long did it take to get the final version of the song and what’s the process? Jim Fogarty of Bing Studios is awesome to work with and he gave me a great deal on studio time! Adding his piano skills as well as his sound engineering expertise, Jim spent ten hours with me and Pete the first day and another five hours two weeks later for the finish work and editing. He hooked me up with a mike and headphones, and played Pete’s instrumental version in the background for me to sing with. He gave me a few tips along the way, but essentially, it was just singing take after take and then editing the best pieces together. It’s really an amazing process, especially when he starts manipulating things with auto-tune and adding background and harmony. He was able to take out any excess vibrato in my voice (opera training has its downside), and clear up any pitchiness. As he put it, “It’s still you. We just accentuated the excellence and removed the suckage.” To keep things fun, and not drive himself totally crazy listening to the song a thousand times, he would change the words once in a while, singing “Pizzas of love, pizzas of looove…” That’s when I knew it was time for a lunch break. I won’t even tell you some of the other lines he added. When it all got to be too much, he’d flip over to Three Stooges movies for a short giggle break. 5. 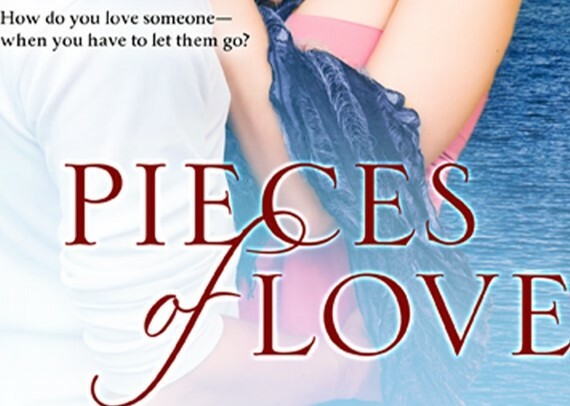 The cover for PIECES OF LOVE is just gorgeous! Can you give us an idea of how you work with a cover artist to get just the right look for your book? That is a challenge, Suze. I start with gathering stock photos that I like to represent the characters. Some cover artists will do this for you and give you some choices, but I generally know what I want and it saves time. I pay anywhere from $10-20 for a high resolution stock photo from Big Stock Photos. Cover artists usually have a form for you to fill out, asking you to detail the tone of the book, genre, color preferences, story concept, etc. Once they have all that information, they will work up several covers to choose from. It takes a few times going back and forth to decide which font works best, and to make necessary adjustments until I’m satisfied. It’s a relatively quick process if you have a good cover artist and you know what you want. If you’re picky like me—or unsure of your vision, it can take a little longer. Kim Killion from The Killion Group, made this cover for me in only a few days. Granted, she had a design concept already made because I had original hired someone else who came up with the basic design but just got too busy and wasn’t able to make the changes I wanted. It was a bummer starting all over with someone new, but I’m so pleased with the results of working with Kim, I’m planning to re-brand my Lily Carmichael covers this summer. 6. What are you working on now? What’s your next book and when can we expect it? Gulp! Isn’t that always the question? 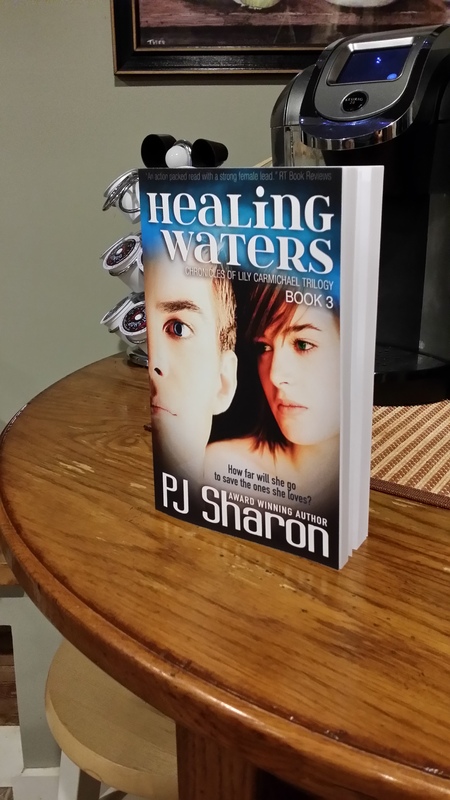 I’m working on HEALING WATERS, book three in the Chronicles of Lily Carmichael trilogy, and hoping to have it done later this year. Thanks, PJ! Can’t wait to read (and review!) PIECES OF LOVE. 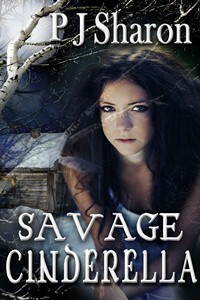 Readers, until June 30th, PJ has her book on sale for only $2.99 for Kindle, Nook, and i-Tunes e-readers. The price goes up to $4.99 on July 1st, so don’t miss out! Thank you, Suze, for taking time out to set up this interview. The support and generosity of my Scribe sisters is what keeps me going some days. In case I haven’t told you lately…you’re awesome! Questions, comments? Any good books on your vacation TBR pile? Do you listen to BTR? For those who haven’t heard of it, BTR stands for Blog Talk Radio, the latest in on-line entertainment and informational programming. Everyday professionals, experts, and entertainers are hosting their own radio shows and being heard by millions. These topic-driven programs allow listeners to hone in on their interests and hear the latest news in whatever industry that floats their boat. So what does that mean for readers and writers? So glad you asked! PJ Sharon here with the latest scoop on how to help writers find their audience and readers connect with their favorite authors. Writers can share their books and talk about their writing process with interviewers while sitting behind their computer or on their phones, feet up and fuzzy slippers gracing their desks. All while sipping tea and chatting about their favorite things with whomever decides to tune in. Fans or readers can type in questions to be asked and answered in real time, or a link to the show can be used later for promotion and advertising purposes. For readers who love romance, it’s a chance to hear your favorite authors dish about their characters, read excerpts, and maybe even share a few spoilers about upcoming books. Basically, it’s another way for readers and writers to connect in a fun, user-friendly format. The really cool thing is that anyone can host their own show. Of course, that means adding consistent content, being entertaining and engaging, and building an audience over time. It’s not for everyone, but those that are doing it appear to be enjoying the up close and personal interaction and sharing it with listeners. I’ve done several such interviews over the past year or so and I have to say, I love doing them. It means not having to actually be on camera, but being able to hang out as if I’m conversing with a pal on the phone. It’s very non-threatening. 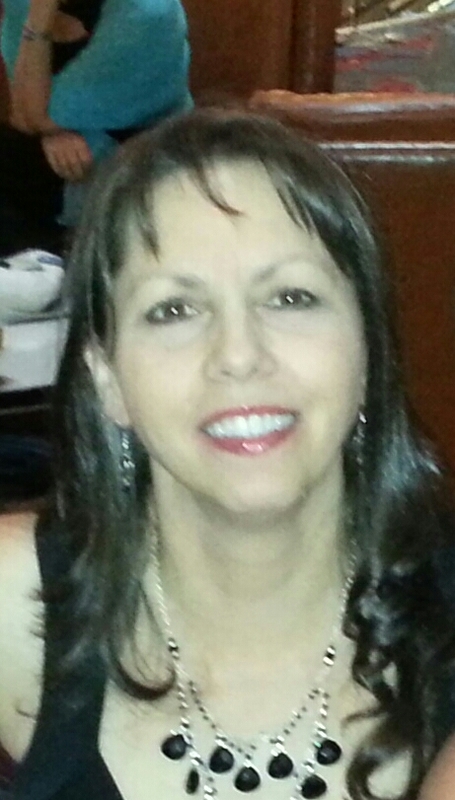 My most recent BTR interview was in February with Linda Mooney from Other Worlds of Romance, who hosts mostly sci-fi/fantasy writers and has a decent following. She asked me to come on the show and read a steamy excerpt from WESTERN DESERT, book two in the Chronicles of Lily Carmichael trilogy. Several listeners showed up to ask questions and I had a blast sharing my story with them, including behind the scenes insights into the third book, the title of which I’ll reveal at the end of this post as promised last month! After the show, Linda sent me the link to embed into my website so readers can refer to it and listen at any time. What a great promotional tool and something I can definitely add to my press kit. I’m sure if I use it properly it could lead to TV/radio interviews in the future. It’s a way for media types to hear how well you speak about your books and interact with the interview process. You can find a list of hundreds of shows that might be willing to host romance authors here. Or you can go in and search categories for more specific shows that focus on your genre. Just one more way to connect readers and writers in the digital age! 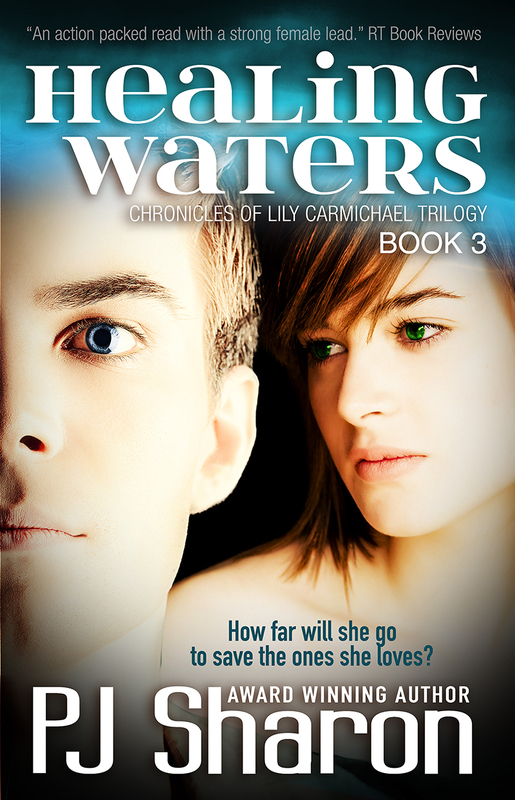 Now, to reveal the title of the third book in the trilogy…drum roll, please… we had WANING MOON, WESTERN DESERT, and coming this fall…HEALING WATERS, the continuing adventure of Lily Carmichael and friends as they make their way back home to warn the good folks of Stanton of a coming doom. Will they reach them in time…or is it already too late? Can Lily and Will overcome their differences and find their way back to each other as they race against time to save the human race from certain destruction? Don’t forget to join me on my PJ Sharon Books FB page as I roll out the cover reveal for my next Contemporary YA novel, PIECES of LOVE, set to release June 21st. The big reveal will take place on April 18th, but pop over and “like’ my page now so you don’t miss out on the fun as I reveal a new “piece” of the cover each week along with an excerpt. Leave a comment on my FB post and be entered to win an ARC of the book, winners to be drawn on reveal day, April 18th, when you’ll also be privy to links for the release of my single, PIECES of Love, the theme song to the book. Tell me, have you ever listened to BTR? Are blogs dead or simply evolving? PJ Sharon here with a few questions for you. I hope you’ll stick around long enough to take the short survey at the end of this post. We appreciate your opinion and it should take less than a minute of your time. The results will be used to help us determine what changes we’ll be making to the Secrets of 7 Scribes in the coming weeks. It has become increasingly clear that the world of publishing–and writing in general–is evolving quickly. Not that good grammar, great content, and entertaining interaction with a like-minded community will go out of vogue, but the way we interact is ever changing. With so many demands on our time and the speed at which communication has progressed, our current attention span has been reduced to about seven seconds per clickable nano-byte of information. In other words, we have about seven seconds to grab someone’s attention and hold it. Which is why venues like Instagram, Vine, and twitter are so popular with tech-savvy readers. It’s also why daily writer’s blogs such as ours are rapidly going the way of the dinosaur. My Scribes sisters and I are committed to bringing you quality content, but we recognize that we have all grown beyond being writers only. Many of us are now published authors with busy production schedules, deadlines, and the myriad of marketing duties that go along with the job. After three years of daily blog posts, we need to re-evaluate our goals and decide what works best for us and our readership. Before we make major changes though, we’d love to hear from you about what you’d like to see from us in the coming year. Please take this survey or leave a comment below with your suggestions, questions, or concerns. In appreciation for your participation, and to thank you for your continued support, I’ll be offering a free critique of a query letter, synopsis, or first chapter of the current work in progress of one random commenter below. Just let me know that you’ve taken the survey or leave us some suggestions of what you’d like to see here, and you’re in the running! If you aren’t a writer, let me know that too, and I’ll think of some other fabulous prize for you if your name gets picked…hmmm…thinking…signed copy, gift card, or swag…I love surprises, don’t you?